What's better than corned beef and cabbage and green beer on St. Patrick's Day? The Irish restaurants and pubs in the Washington, DC area will be hopping with Irish cheer on March 17th. You don't have to be Irish to enjoy the festivities and you will find that a variety of Washington, DC area restaurants get into the spirit by celebrating St. Patrick's Day with food and drink specials. The St. Patty’s Day SoberRide program will be in operation beginning at 4:00 p.m. on March 17 and continue until 4:00 am the following day as a way to keep local roads safe from impaired drivers during this traditionally high-risk holiday. Read more about SoberRide. St. Patrick's Day Parades- Celebrate St. Patrick's Day at a parade in Washington, DC, Alexandria or Manassas, Virginia or Gaithersburg, Maryland. Annapolis Irish Week - March 10-17, 2018. Annapolis, Maryland celebrates St. Patrick's Day with ten days of events including a parade, music, an Irish Coffee competition and more. National Shamrock Fest - March 17, 2018. Enjoy a day of family fun at the largest Saint Patrick's Day party and street festival in the DC area featuring more than 50 live bands. 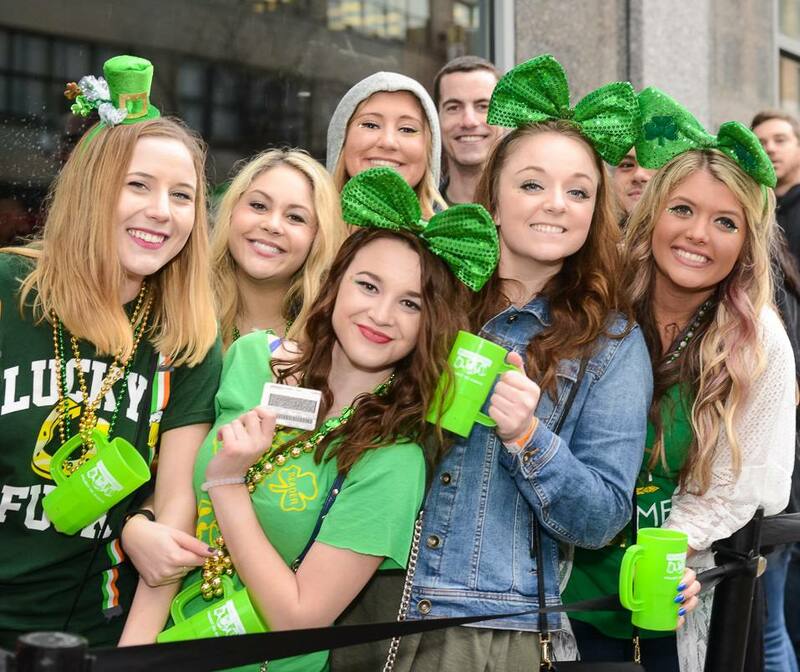 March 17, 2018, 1 p.m. to 9 p.m.
An annual St. Patrick's Day bar crawl registration is between 2-6 p.m. The Irish Stroll includes food and drink specials at multiple venues. Participating pubs in 2018 are Decades, Blackfinn Ameripub, Gryphon, Dirty Bar, Dirty Martini, Living Room, Public Bar, Barcode, and The Big Hunt. Purchase in advance online and pick up wristbands and maps at Blackfinn Ameripub, Decades, or Dirty Bar. Tickets are $15. You can also register at the three aforementioned bars. Enjoy a special Irish happy hour available all day, every day, and authentic live bands throughout March at Georgetown’s Ri Ra. Starting at 9:30 p.m. from Tuesday to Saturday of St. Patrick's Day week, listen to the music of Derek Dempsey and Celtic Soul. Catch the 2018 Six Nations rugby matches on St. Patrick's Day and get a breakfast sandwich and a pint for $11. On March 17, the party starts early as the restaurant typically opens at 7 a.m. for a traditional Irish breakfast amidst a statue of St. Patrick himself. The festivities continue throughout the day with live Irish dancers, bagpipe players and more performances by Irish musical acts. Celebrate all things Irish with special events all month-long including European sports, including English Premier League soccer, special whiskey dinner, live music, Pub Quiz, fundraisers, wearing green, eating traditional Irish food, connecting with community through charity, and, of course, drinking Guinness and Irish whiskey. St. Patrick's Day, March 17 - Doors typically open at 8 a.m. Live Music. The event celebrates a full day of green revelry and fun group shenanigans with fellow Ireland- and beer-loving participants. In 2018, specials are $2 beers, $3 rail drinks, $4 shamrock shots, $5 Irish car bombs, and various food specials. Participating bars include Public Bar, District Anchor, Cafe Citron, Eden, The Bottom Line, Recessions, 1831, The Front Page, Rose Bar, Kabin, Ozio, Bravo Bravo, Heist, and James Hoban's. The Dubliner, one of the largest purveyors of Guinness Stout in the country, celebrates St. Patrick's Day through the weekend with live music and good Irish eats and drinks being served. The music lineup on March 17, 2018 features John McGrath, Brian Gaffney, and Morris Minor. March 17, 2018. 1423 P St. NW Washington DC (202) 332-3710. Specials from 5:00 p.m. until close. Specials in previous years have included Bangers & Mash ($18), Irish Beef & Beer Stew ($18) and a Stout Float with vanilla ice cream, chocolate sauce, whipped cream, and toasted hazelnut ($10.50). Drinks include Dublin Mules, Irish Old Fashioned drinks, and a Guinness & Jameson special. In addition to specials, each table received a St. Patty's Day Trivia card with the opportunity to win prizes.